Another story: “For Hillary Clinton, having her own baby grandchild to kiss on the campaign trail, could be one of the biggest boosts to her possible presidential election campaign.”. A big “boost” for this former White House resident? No doubt Billy, the female predator, wants back in the ‘oral office’ to play his ‘games’, and Queen Hillary must still have nightmares over the office being stolen from her in ’08, by some neophyte upstart. Oh the horrors. But having a grandchild has nothing to do with abilities. I have to give all these whoopty doo’s and rankering hubbub about a Clinton baby, a yawn and sigh of disgust. Disgusted not about a baby, but the facts. A child or grandchild should have and would have nothing to do with a man running for office. Nor should it. It should therefore, having nothing to do when some woman runs for office. A grandchild does not give Hillary credibility for any office. 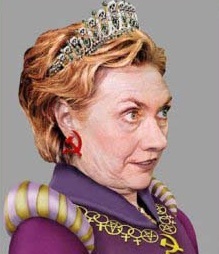 . . Hillary would likely kill (and who knows with the Clinton reputation, might have) to be Queen for Four Years, should she live that long. And after all, we mustn’t forget the Democrats are the Party of Death as they worship their sacrament of abortion . . so why would they dolt over a baby? Any baby? But this child will give no integrity or validity to this horrid Leftist woman, who isn’t competent enough to be President….. or dog catcher. Put her in Burger King where she can’t hurt anyone with her broken-Barack ideologies. But the Leftist loving, drooling media will love to find anything to give the aging, former Enabler, a “boost” of any sort. Hillary didn’t answer that “3:00 am” phone call, regardless of how the new TV show, ‘Madam Secretary’, wants you to believe. She didn’t even answer the phone when asked several times for “increased security”. Hillary made the decision not to send more “security” . . . . it didn’t fit with the regime’s dogma that “al Qaeda was on the run”. Evidently, ‘on the run’ to Benghazi to murder Americans. It was her responsibility, as with Barack Hussein, to see that didn’t happen. She accomplished nothing earnest as Senator, having moved to New York knowing the Democrat state voters would be stupid enough to elect her. They were. We don’t want to make that mistake ever again. You know that’s right, though I think she may wear a bigger pare to hold the size of her ba$$s…. 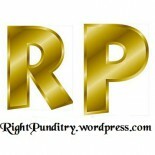 This entry was posted on September 30, 2014 by RightyPunditry in Conservative Values, News, Politics and tagged Benghazi Hillary coverup, Bill Clinton, Clinton grandchild, Hillary Clinton, incompetence, Just Say No to Hillary.